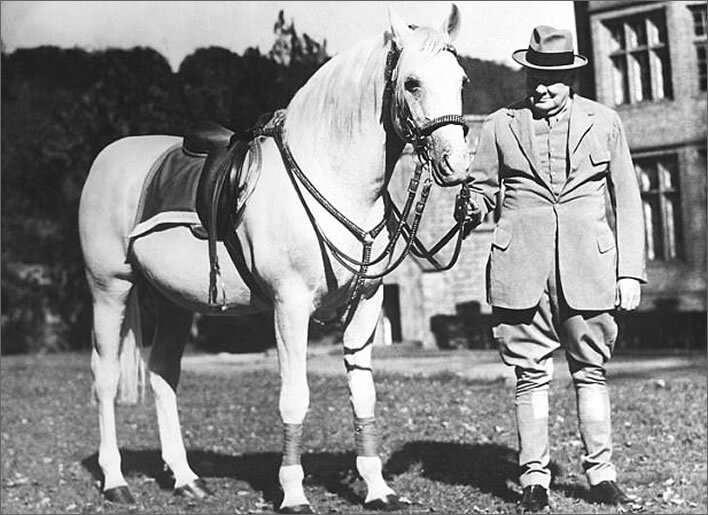 The British Prime Minister Winston Churchill (1874-1965) loved his pets – his dogs, cats and birds – but also the animals in his grounds – the swans, geese and goldfish – and above all – as rider, cavalryman and polo player – his horses. 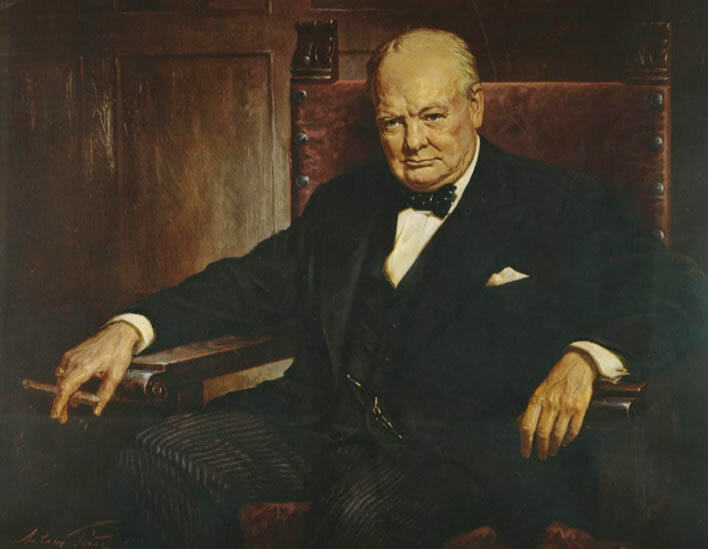 Winston Churchill in a portrait by Arthur Pan, painted possibly in 1943. The painting was reproduced in the London Illustrated News at Christmas 1943. Pan (1894-1983) was a Hungarian, a refugee from the Nazis, who painted a number of portraits of Churchill. Image: ©IWM (HU 69983). It all started with hunting. As a member of an aristocratic family – one of his ancestors was John Churchill, Duke of Marlborough (1650-1722), the victorious commander in the War of the Spanish Succession (1701-1714) – it was expected that the young Winston learn to hunt and to fish, and not just with shotgun and fishing rod. As was also usual in his circles he went fox hunting with hounds (which has been banned in Britain since 2005, such pursuits being known as 'blood sports'). But not only the pheasants and partridges in Scotland but also the stags, hares, deer and boars in England lived dangerously when Churchill went hunting. 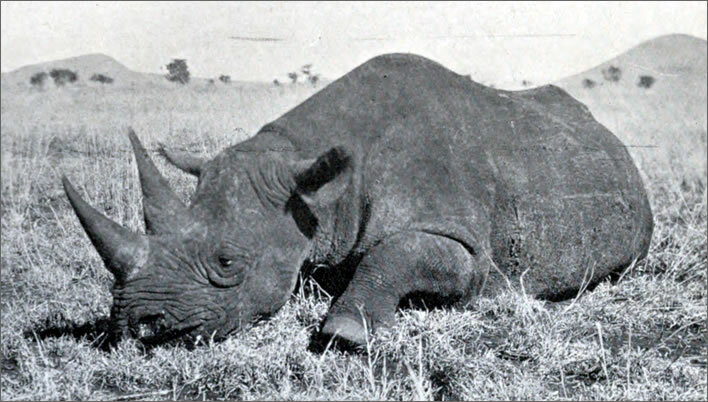 In Africa, the young adventurer not only killed crocodiles and ostriches but also – one shouldn't really say it these days – three rhinoceroses. At such a range [120 yards] it is easy to hit so great a target; but the bull's-eye is small. I fired. The thud of a bullet which strikes with an impact of a ton and a quarter, tearing through hide and muscle and bone with the hideous energy of cordite, came back distinctly. The large rhinoceros started, stumbled, turned directly towards the sound and the blow, and then bore straight down upon us in a peculiar trot, nearly as fast as a horse's gallop, with an activity surprising in so huge a beast, and instinct with unmistakable purpose. These and the next texts and images are taken from his work My African Journey, 1909. 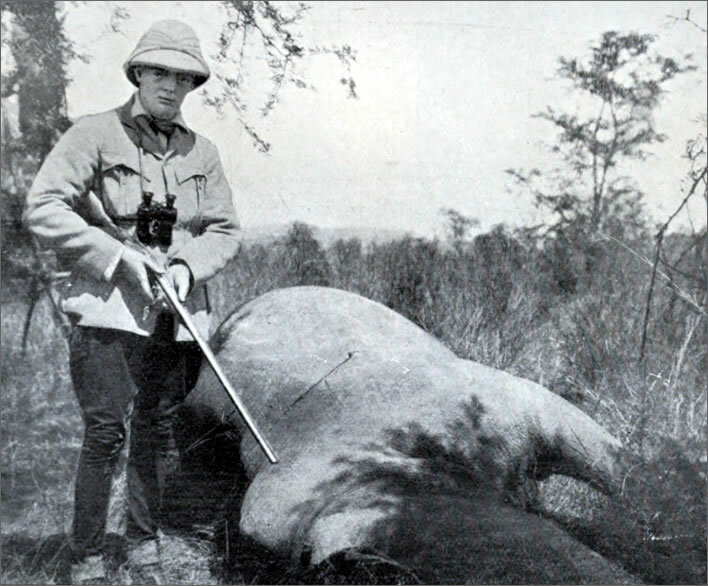 The photograph of Winston standing by the black rhino was used as the frontispiece of the book. When you fire a heavy rifle in cold blood it makes your teeth clatter and your head ache. At such a moment as this one is almost unconscious alike of report and recoil. It might be a shot-gun. The nearest rhino was broadside on. I hit him hard with both barrels, and down he went, to rise again in hideous struggles—head, ears, horn flourished agonizingly above the grass, as if he strove to advance, while I loaded and fired twice more. That was all I saw myself. To shoot a good specimen of the white rhinoceros is an event sufficiently important in the life of a sportsman to make the day on which it happens bright and memorable in his calendar. Churchill, as child and youth, also loved animals. As much as he liked to go after hares and rabbits with his shotgun, he also loved his various pets – rabbits, cats and dogs. It went so far that at boarding school he sold his bike in order to buy a bulldog. His love for animals developed fully after he – by then a successful author, member of parliament and government minister – bought in 1922 a large and beautiful estate: Chartwell, in the county of Kent. Here he built almost immediately three lakes in which not only native ducks and geese made their homes but also black swans from Australia. Where he once as a small boy hunted butterflies and pinned them into his collection, now he bred them. He took particular pleasure in the goldfish he kept in a separate pond, which he fed with particularly fine maggots he obtained specially from Yorkshire. Always ready for a joke, he trained the goldfish with a Pavlovian reflex: when he stood at the edge of the pond with a visitor and made a clicking noise with his tongue, all the fish would rise up to the surface. 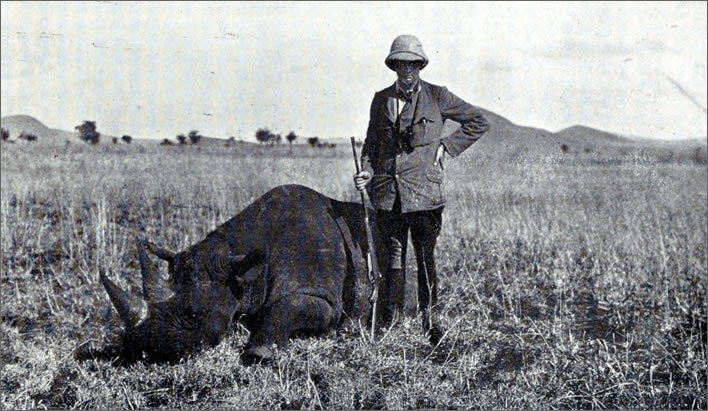 Churchill seemed to be at ease with any animal. 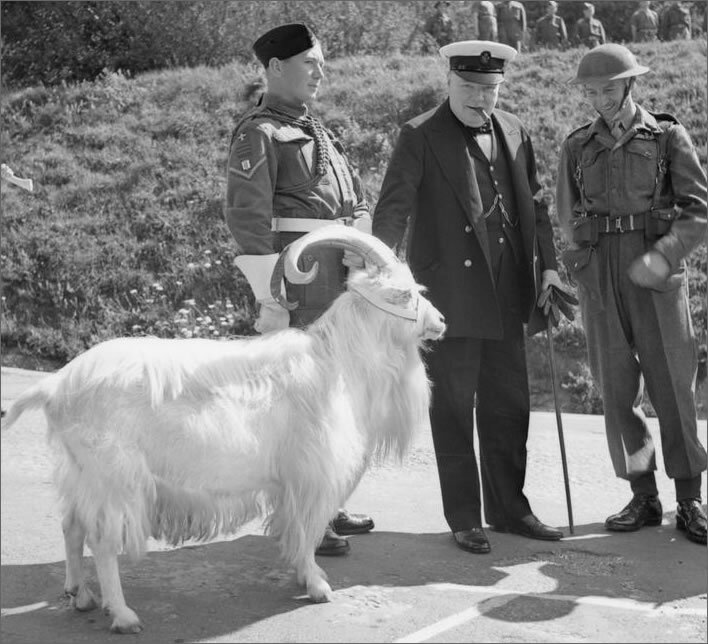 Here he is inspecting Billy, the regimental goat of the Royal Welch Fusiliers, during his visit to a garrison on 17 July 1943. Image: ©IWM (H 31391). But in general no creature was too lowly to wake his sympathies. During a round of golf he saved an earthworm from being trampled on. And when, during the war, a ladybird landed on his sleeve he asked an American general to get it into safety and let it fly off from the window. 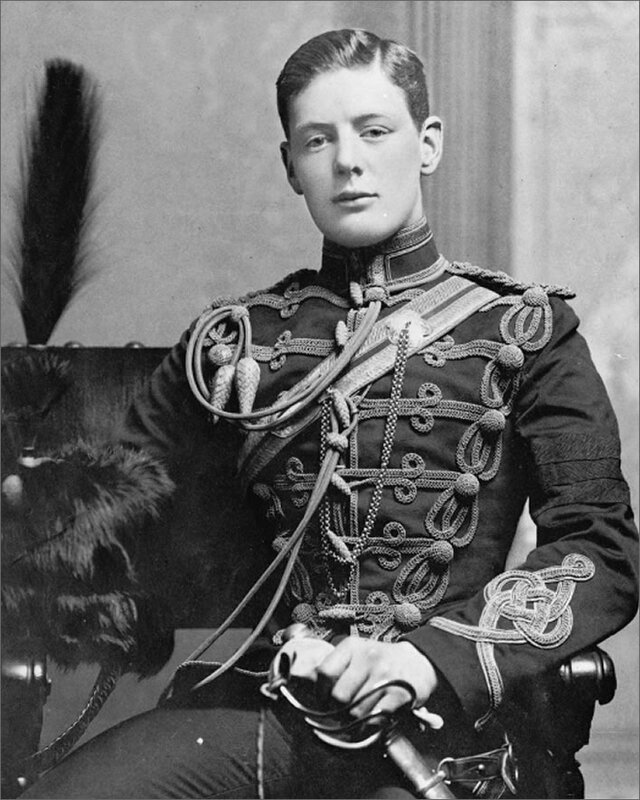 2nd Lieutenant Winston Churchill of the 4th Queen's Own Hussars in 1895. ©IWM (5426F). Churchill learned to ride in his childhood and his love of horses went deep into his nature. As a cavalryman and war reporter in five wars on four continents between 1895 and 1900 he learned to rely on the horse under the most extreme conditions. On 2 September 1898, in Omdurman in the Sudan, Churchill rode in one of the last cavalry charges in British history. 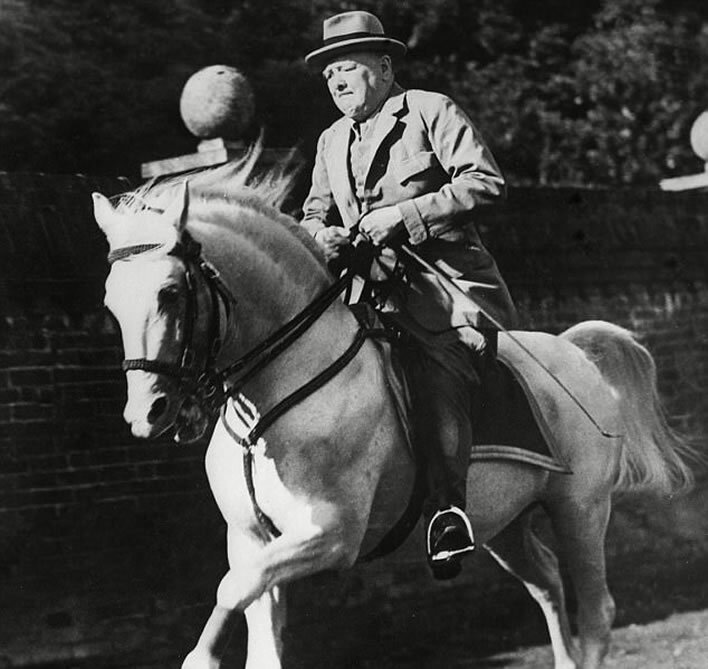 Churchill riding his horse Salve in the grounds of Chartwell. Later, as a career politician and government minister he had little time for riding, although it was after the Second World War, when he was 74, that he sat on a horse for the last time. However, some years later, after his second period as Prime Minister (1951–1955) he had much pleasure in his racing horse Colonist II. 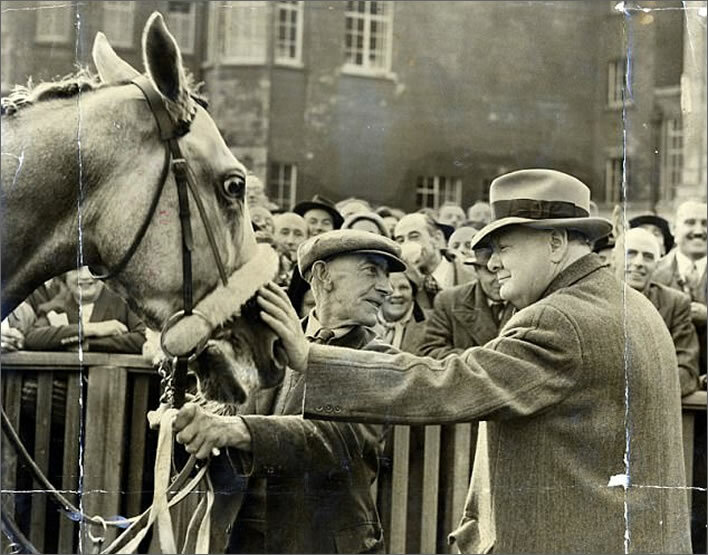 Churchill with his racehorse Colonist II after it had won the Lowther Stakes at Newmarket. Colonist II was his most successful racehorse, winning 13 races in all. On the occasion of an important race he whispered into his ear: 'Colonist, if you win this race you will never have to race again but will be able to spend your twilight years with a couple of nice fillies.' Unfortunately, Colonist didn't seem to get the message: he came fourth. Churchill in 1934 with Salve. 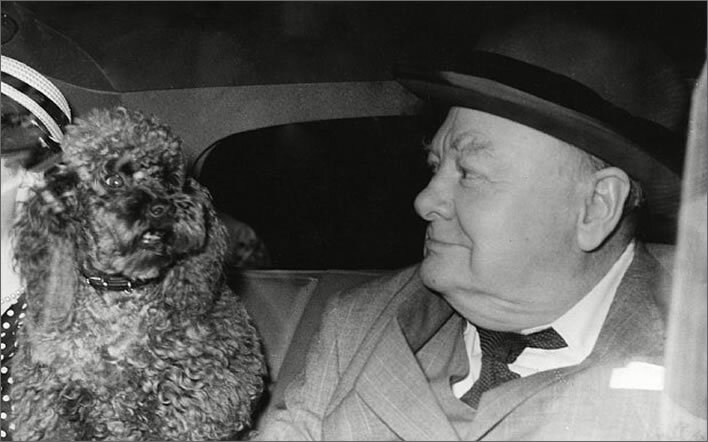 Churchill in a car with Rufus. The photograph is undated, but the dog is almost certainly Rufus II. The first Rufus was run over by a bus at the Conservative Party conference in Brighton in October 1947. 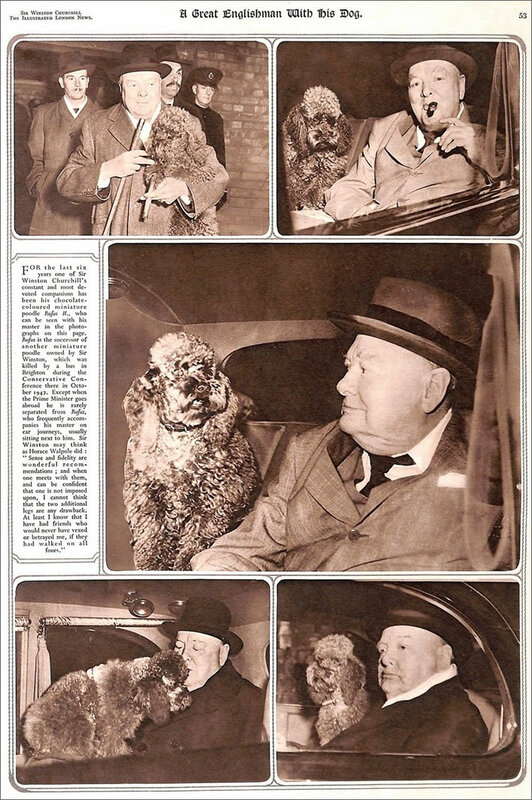 The image bottom right was taken as Churchill (then Leader of the Opposition) was leaving Buckingham Palace in October 1951 after visiting to enquire after the health of King George VI. The King was recovering from an operation on 23 September to remove his left lung, hence Churchill's earnest expression. He died four months later. Sharp-eyed readers will notice that the larger image in the middle is the same as that in our proceeding photograph, except that the lady sitting next to Churchill on the back seat has been unceremoniously obliterated. Churchill stroking Rommel affectionately. Two pet-lovers together: Winston Churchill and General Montgomery with Montgomery's cocker spaniel Rommel. 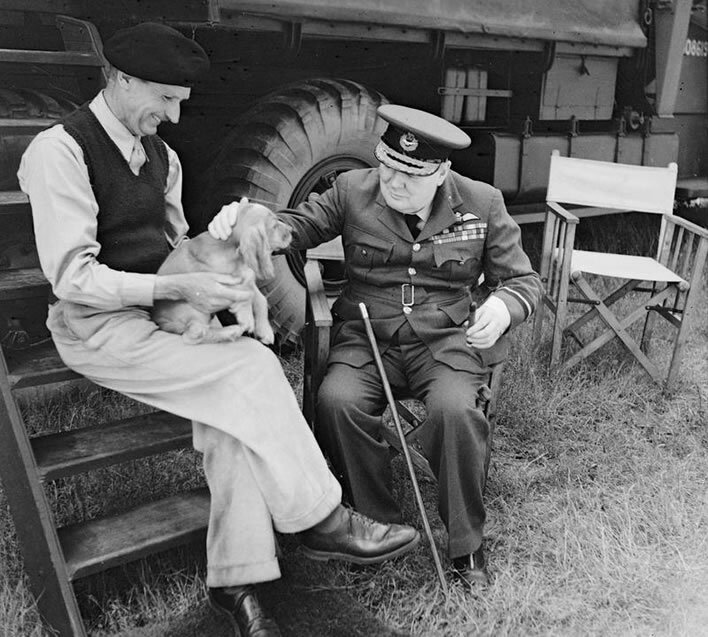 The photograph was taken in Normandy at Montgomery's caravan at his headquarters at Chateau Creully on 7 August 1944. During the Normandy campaign Montgomery had both his cocker spaniels Hitler and Rommel with him as well as a cage of budgerigars. Image: ©IWM (B 8766). The second pet in his household hierarchy was Jock, the marmalade cat, who had been given to Churchill by his Private Secretary, Sir John (Jock) Colville. Jock the cat and all his successors were allowed to sleep on the bed of the Prime Minister. With both these animals Churchill had an almost human communication: he talked to them as though they were people. 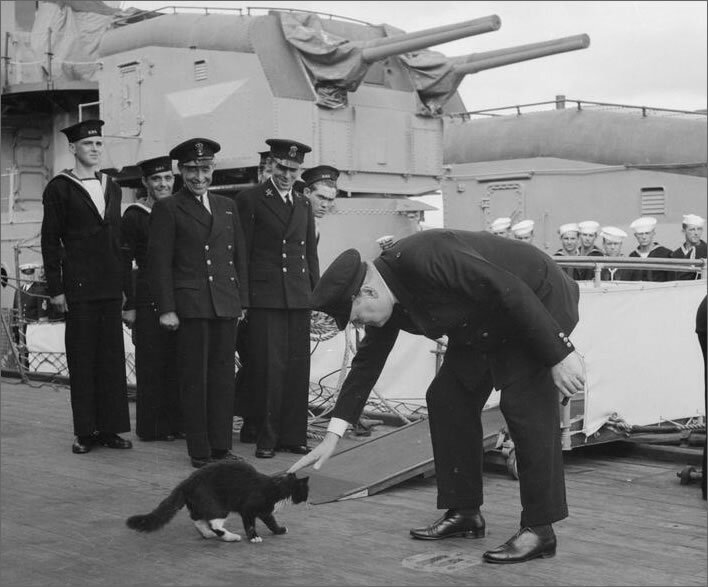 While the company stands to attention for a national anthem, Winston Churchill stops 'Blackie', the ship's cat of HMS Prince of Wales, from crossing over to the USS Augusta. The incident took place during the Atlantic Conference in Placentia Bay, Newfoundland in August 1941. Image: ©IWM (H 12756). The relationship with Toby, his canary, was even more extreme. He was allowed to fly freely around in Churchill's study, sit on his head and – even worse – land on his cigar and pick at it. That was not the worst, though: Toby was free to fly around even when important visitors were there. Richard Austen ('Rab') Butler, Churchill's Chancellor of the Exchequer between 1951 and 1955, was 'decorated' no fewer than fourteen times during one meeting. Butler could only conclude in consternation: 'It is unbelievable what I do for our Winston.' As time went by, Toby gained a taste for the various drinks of his master to such an extent that he once fell into the Prime Minister's brandy glass. One of Churchill's cats during the North African war caused a diplomatic crisis at the highest level. Churchill was on the phone one morning with the commander in North Africa, General Claude Auchinleck. The news was bad and Churchill was nervously waggling his big toe. The cat's hunting instinct was awakend and he pounced on the toe. Churchill was startled, gave the cat a kick and shouted 'Buzz off, you idiot!' The general was at first speechless but was calmed by Churchill once he had recovered from the cat's attack. Winston Churchill's idiosyncratic relationship to the animal world even influenced his marriage. His wife Clementine had the nickname 'Cat' and Winston himself was 'Pug'. Very often they signed their letters as Cat or Pug alongside a sketch of the respective animal. It is also a notable fact that they even greeted each other in these roles. Very often, when the door closed behind his back in Chartwell, he would greet Clementine with 'woof-woof', to which she would respond with 'miaow'. This article was written by Dr. Werner Vogt. An earlier version in German appeared in Tierwelt on 9 July 2015. This translation ©FoS.